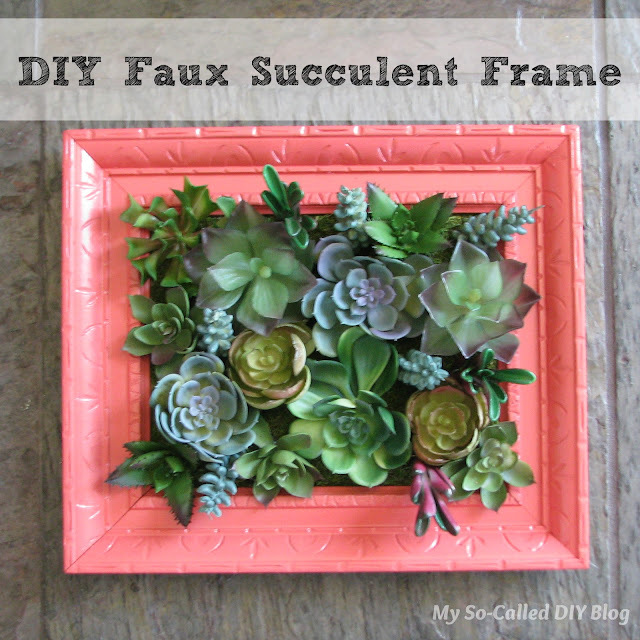 And by "faux," I mean artificial succulents, of course! 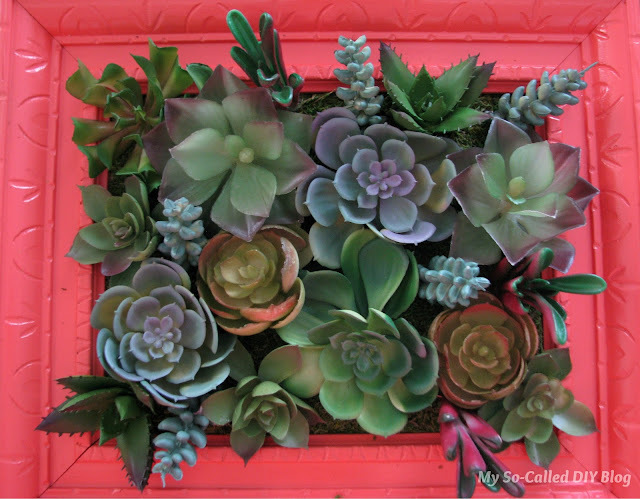 I have been drooling over some living succulent frames I saw on Pinterest. But, I don't feel like I have enough light in my living room to keep one alive. Hobby Lobby has some beautiful artificial succulents, but a worker told me they would never go on sale. So, I figured I'd just buy one with a coupon every time I was nearby until I had enough. Then I went to Target and saw this artificial succulent wreath. Someone had ripped one off, so it was 70% off. I grabbed it and decided to just use the remaining succulents from this wreath! I had this old frame I got at a thrift store, that I've been waiting to use on just the perfect project. I sanded it a little and painted it with some coral spray paint. I cut out a piece of cardboard to fit snuggly in the opening. As I started to lay out my design, it became obvious that I'd need some sort of background, so you wouldn't just see cardboard in between the gaps. I already had this beautiful sheet of moss still in the package, but even just using moss from the Dollar Tree would work since most of it will be covered. I cut and hot glued it in place. I propped it up on a container so I could cut holes through the moss and cardboard. I used a steak knife to cut an opening for the stems and then put hot glue on them to hold them in place. I kept the stems short, so the frame would still be able to rest flat on the wall. (Back view). I love the end product! This is so cute. 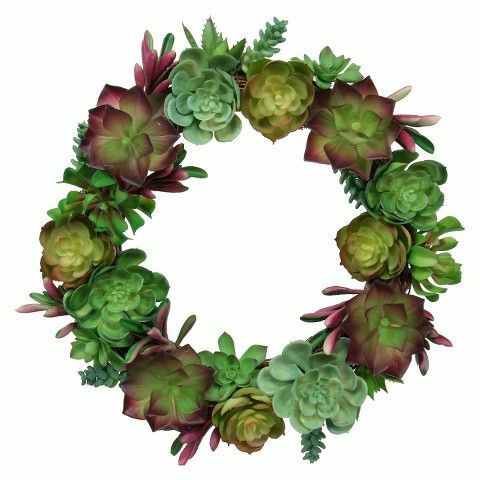 I've wondered, too, if I could keep the plants alive on a wreath, so this is a great alternative. By the way, I would love to have you post on my new blog hop—the Weekend Blog Hop at My Flagstaff Home (www.myflagstaffhome.com). It begins on Thursday evenings and lasts through the weekend, if you're interested. I love it! I would never guess that those are faux succulents. Great idea to use the moss for the background too. Thanks so much for sharing your idea at Vintage Inspiration Party. That was an awesome deal you got for the succulents! It's a gorgeous frame! This is really beautiful look of American flags and large buntings from Amazon. Btw, what's the price of these? you did a really wonderful job. And good luck to your next scrap wood stars.